So many times, I have heard this, usually from “non believers”, but occasionally I myself am guilty of such thoughts. Well now…… If you have been training with me, you have been exposed to a variety of Qigong and Taiji sets. It is important to keep in mind that eventually, as you assimilate the principles into your life, everything will be Taiji. Yet in the beginning, we all need some ‘forms’ to direct us in the Way. This page is just a list of some of the forms that I have shown to my classes and some for advanced students. With so many options, it is easy to just pick one or more depending on your goals or time frame. All of my beginner students have been doing the first four or five on this list, and I consider these a “core group” of practices. Over time, I will show everyone all of these sets. Now, I wouldn’t want anyone to get bored, so add the others in occasionally as you want to. There is always time to get in a quick “Soaring Crane” or some Zhan Zhuang practice anywhere any time. 1.) “Wuji” a standing qigong for overall health, perform for one minute to as long as you wish! 2.) Dong Family “Warm up Qigong” strengthens the posture and opens the joints. Takes about 7 to 8 minutes to perform. 3.) Wudang Daoist Abdominal Breathing Qigong, five simple exercises that form the foundational skills for all qigong, taiji and meditation practice. 4.) Dong Family “Basic Qigong Set” builds and distributes qi through the whole body. Takes about 7 to 8 minutes to perform. 6.) “Dong (Yang) Style Taijiquan” The first section of the long form of Taiji (Tai Chi). A total body and mind Qigong and martial art form. Takes about 6 minutes to perform. 7.) The Dong Family “Hard Qigong” A zhan zhuang practice that builds structural integrity in your physique. These ten postures can be done in as little as 5 to 10 minutes or as long as you wish. 8.) “Dong (Yang) Style Taijiquan” The second section of the long form of Taiji. Takes about 12 minutes to perform. 12.) Yiquan Zhan Zhuang. Eight basic standing postures and a few other simple postures designed to open the hips and strengthen the legs and back and build structural integration into your physique Takes from 5 to 40 minutes to perform. 13.) “Dong Sitting Qigong, Long Form” From Master Dong Zeng Chen. A total mind and body Qigong for meditation, thrusting vessel, small circle qi and upper body strengthening. Takes about 30 to 40+ minutes. 14.) 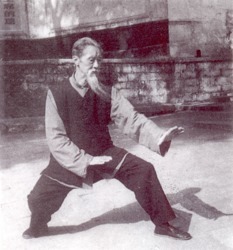 “Dong Sitting Qigong” From Master Dong Hu Ling. A simple sitting routine for the upper body qi, the mind and the eyes. 15.) Five Elements Qigong, Wu Xing Qigong is a nine form set that is a medical qigong toning the internal organs and meridians. See video here: Ziranmen Five Elements Qigong. 16.) Muscle and Tendon Changing Classics, Yi Jin Jing is one of the oldest known set of gigong, originally authored by the famous Da Mo. 17.) The Eight Brocades, Ba Duan Jin is another old classic set. 18.) Zi Fa Gong, spontaneous Qigong comes when you have figured out some of these basic sets then you let your qi body lead you to move or not to move. Do some Qigong everyday! Keep it simple but……Do it!